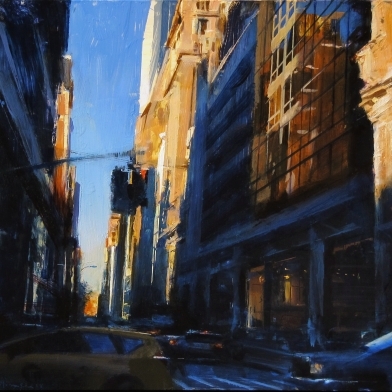 Jenkins Johnson Gallery San Francisco is excited to present Distilled Realities, a solo exhibition of Ben Aronson’s vibrant, atmospheric cityscape paintings of San Francisco, New York, Chicago, Paris, and Rome. Synthesizing the gestural energy of emotionally charged abstract expressionist brushwork, influenced by Richard Diebenkorn, with the observational precision of contemporary realism, Aronson’s new, psychologically arresting paintings land for a dynamic fifth solo show at the gallery. The opening reception for the artist will be held on Saturday, May 19, from 4:00 pm to 6:00 pm. The exhibition will be on view from May 19 through July 7, 2018. The gallery will be closed Tuesday, July 3, and Wednesday, July 4, in honor of Independence Day. Ben Aronson states, “The making of successfully expressive art requires some sort of visual distillation of priorities excerpted from reality. In order to create a heightened reality, rather than simply recreating visual scenes with a collection of carefully rendered details, the goal is not only physical likeness, but more importantly, the prioritization and selection of certain key visual elements.” This Aronson continues creates “a personal shorthand which serves to deepen and intensify our emotional connection to the work.” With this shorthand, Aronson creates paintings that speak to the particular evocative ethereal nature of pausing for a moment to look at the city as it moves around you. Through the haze of fog, the blurring of blues in the sky, the moving of leaves in the wind Aronson’s language is distinct and intoxicating. 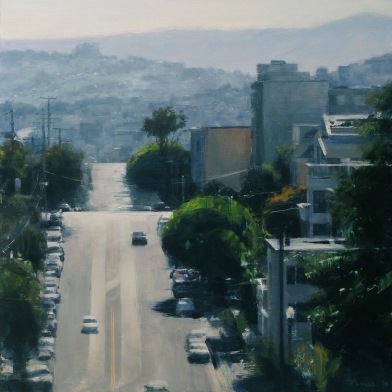 With loose painterly strokes and a deft rendering of atmospheric light, fleeting and familiar moments of cars breezing by and the afternoon sun casting long shadows onto the road materialize in visual poetic verse. Building from studies created en plein air, Aronson’s specificity and attention to light and shadow transport his viewer to a precise location and an exact moment in time, from early morning in the Hollywood Hills to late afternoon in SoHo. Foundational to Aronson’s work is his innate ability to capture light, and the ways in which light varies between and within the cities he visits. While a robust, vibrantly deep orange dominates Morning, Fifth Avenue, a somber, languishing blue washes over Manhattan in Soho. Similarly, San Francisco’s infamous fog materializes with Aronson’s use of cool blue interspersed with a gauzy white; elsewhere, the warm crisp reflective yellow rays characteristic of the sun drenched pavement of streets of Los Angeles pulse. Aronson’s diversified use of light and color demonstrates his range in depicting cities and neighborhoods with specific atmospheric moods. 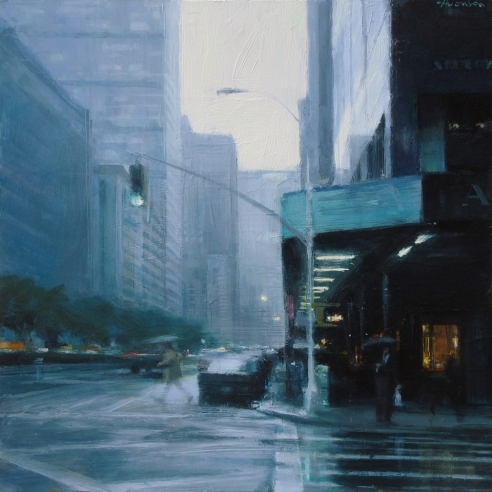 In Morning, Fifth Avenue, Aronson brings order to the bustling Manhattan streets, and slows the fast-paced New York lifestyle to a leisurely tempo. Aronson dissolves surrounding city noise and allows for a brief moment of tranquil reflection. His ability to capture fleeting moments through movement results in paintings that echo this serendipitous spontaneity: they appear instantaneous, and conceal the artist’s time-intensive process of meticulously building their compositions. With Distilled Realities, Aronson returns to California and the roots of his artistic influences, Richard Diebenkorn and Wayne Thiebaud. By meditating on city life in his paintings, Aronson incants the energy of Los Angeles and San Francisco that similarly enchanted and inspired Diebenkorn and Thiebaud, respectively. As Diebenkorn and Thiebaud before him, Aronson’s painterly texture, lush color palette, and aerial perspectives create a palpable sense of the landscape without sacrificing its stunning geometric compositions. Ben Aronson is a member of the highly acclaimed National Academy of Design, alongside Jasper Johns, Willem de Kooning and his mentor, Philip Guston; and a recipient of the 2006 Childe Hassam Purchase Prize from the American Academy of Arts and Letters. Jenkins Johnson Gallery has represented him since 2001, and his work is in the permanent collections of many major corporations and museums, such as the de Young Museum, San Jose Museum of Art, San Diego Museum of Art, Boston Museum of Fine Arts, Museum of Fine Arts in Houston, Denver Museum of Contemporary Art, New Orleans Museum of Art, Rose Art Museum, Butler Institute of American Art, National Academy Museum in New York, and Flint Institute of Arts. Aronson’s work has been reviewed by the San Francisco Chronicle, San Francisco Examiner, ARTnews, Boston Globe, New York Observer, and more.